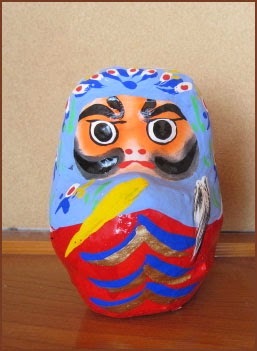 Daruma from Temple Jindai-ji in Mitaka, Chofu　調布 a suburb of Tokyo. 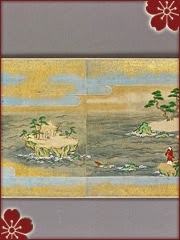 "Ganzan Daishi" , Gansan Daishi 元三大師. This is another name for the famous 18th head priest Ryogen of the monastic center at Mount Hiei, Jie Daishi 慈恵大師 of the Tendai sect. Because he was born on the third of January in 985, he got this name. He had great spiritual power in warding off evil in daily life and many stories of his deeds are handed down to us. was a chief abbot of Enryaku-Temple (Enryaku-ji) in the 10th century, and the founder of the tradition of warrior monks (sōhei). Ryōgen is known generally by the names of Gansan Daishi or Tsuno Daishi "Horned Great Master". The Horned Great Master in Engelbert Kaempfer's History of Japan (1727). On his way to Edo in 1691 Engelbert Kaempfer saw these paper glued to doorposts of many houses. His description published in the History of Japan is correct, but he wrongly called it Gozu Tennō (Ox-head-heaven-king), a deity worshiped at the Gion Shrine (Yasaka Jinja) in Kyotō. Over the course of the 10th century, there had been a number of disputes between Enryaku-ji and the other temples and shrines of the Kyōto area, many of which were resolved by force. In 970, Ryōgen formed a small army to defend Enryaku-Temple and to serve its interests in these disputes. Records are not fully clear on whether this army consisted of hired mercenaries, or, as would be the case later, trained monks. Most likely, this first temple standing army was a mercenary group, separate from the monks, since Ryōgen forbade monks from carrying weapons. In addition to the prohibition on carrying weapons, Ryōgen's monks were subject to a list of 26 articles released by Ryōgen in 970; they were forbidden from covering their faces, inflicting corporal punishment, violently interrupting prayer services, or leaving Mount Hiei during their 12-year training. 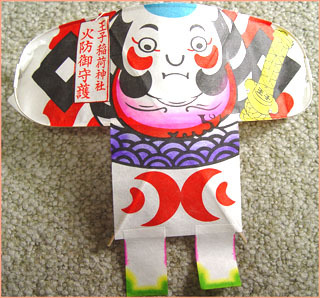 He is also called "Master Warding Off Evil" (mayoke daishi 魔除大師、gooma daishi 降魔大師). 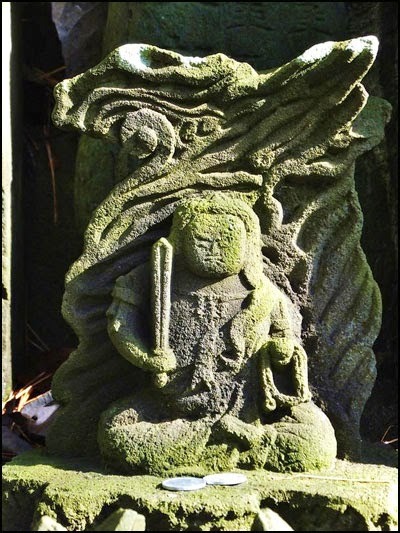 There was a statue of Ganzan Daishi in the temple Jidai-ji, but in the Muromachi period there was a great fire and only this statue was saved, since it flew all by itself into the nearby pond 五大尊池. This episode even strengthened the belief of the people in the supernatural powers of this great master, which is alive until our days. 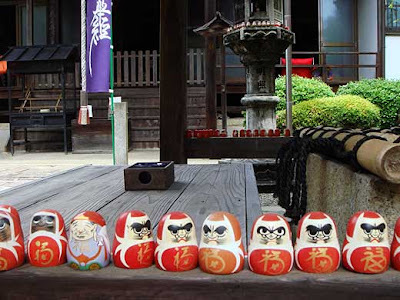 The unification of this Great Master and Daruma san to ward off evil should have a double effect on your good luck, so on the yearly temple festival on Marach 3 and 4 there is a big Daruma market in the temple grounds, where you can buy all kinds of good-luck Daruma dolls. You can ask a priest to paint in the left eye, in this case not the round pupil but the first syllable of Sanskrit A ｢阿｣ to indicate the beginning of your good-luck period. When the wish is fullfilled, you have the syllable UN ｢吽｣, the last syllable of the Sanskrit alphabet painted in the right eye. A is the first sound pronounced while opening your mouth, it is the origin of all sounds and represents the origin of all life, the woumb. UN is the last sound when closing your mouth. (A-UN is the Japanese pronunciation; usually we know this sound as the holy mantram OM or AUM.) In this way at Jindai-ji you have a reliable means to reinforce Daruma san's already salutary properties. We find these symbols of open and closed mouth also for example in the pair of lion-dogs (koma-inu 狛犬) sitting on both sides of the entrance to a shrine or temple, warding off any evil spirits. A can also be interpreted as the entrance to life and UN the entrance to death. In esoteric Buddhism there is also a tradition to meditate on a hanging scroll of this syllable as the symbol for Buddha, called "Visualisation of the Syllable A" (ajikan 阿字観), which we will study a little more further down this story. In the Daruma rendering of Jindai-ji we can feel the history of Daruma coming from India, going through many changes on the way and now through the painting of the eyes being the condensed symobl of the people's wish for long life, happiness, warding off evil and getting benefits in this world. By the way, there is one more temple in the Kanto area where Ganzan Daishi is revered and an annual Daruma market is held, the Kita-In of Kawagoe 川越の喜多院. According to Prof. McFarland, we can also learn this about Jindai-ji temple. "In Tokyo spring follows the Jindai-ji Daruma market." Normally the Daruma markets are held on the first three days of the new year in January, to get your good luck for the rest of the year. The temple Jindai-ji is one of the oldest in Tokyo, coming right after the famous Kannon temple in Asakusa and is well known for its Daruma market. After a visit to the temple you can enjoy a meal of buckwheat noodles, another speciality of this area. The main deity enshrined in this temple is Amida Nyorai. There is the beatuiful old entrance gate with many stickers from the pilgrims over the years. You can also see the bronze gong called "Crocodile Mouth" (waniguchi 鰐口). The temple sells of course a lot of talismans and auspicious votive pictures connected with Ganzan Daishi and Daruma Daishi. There is also a special beer with the name of the temple. Try it on the way home. Some dealers still carry their Daruma dolls in baskets of woven bamboo in the oldfashioned way.
. . . CLICK here for Photos f the daruma market! After you buy a Daruma, the priest fills in the eye for you, as we have learned. "This is a notably unfamiliar subject that emerged from Chinese folktales about the [Chinese] pilgrim Xuanzang 玄奘 (Genjo Sanzo) (602–664), whose journey to India and return is one of the central episodes in the transmission of Buddhism in East Asia. Apocrypahl stories describe Xuanzang striding across the deserts west of Dunhuang, losing his water flask, and becoming desperately thirsty and discouraged. He dreamed of a giant figure with halberd who urged him to continue; soon he came to an oasis and was saved. In Chinese commentaries, the giant was an avatar of the Divine King Vaiśravana (Jp. = Bishamon). 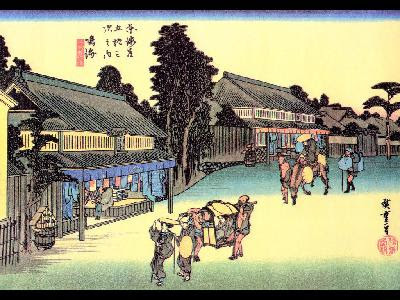 A folk cult and its imagery thus developed in China and were transmitted to Japan in the 9th century. 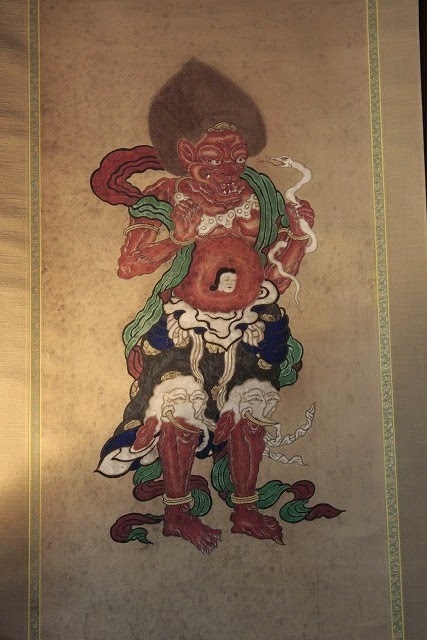 There the Desert General became well-enough recognized to be illustrated in the Esoteric Buddhist ritual handbook complied by the Japanese monk Kakuzen 覺禪 (active 12th century). The general also appears as Bishamon in a 14th-century Japanese handscroll illustrating Xuanzang's journey to India .......... emerging from the [statue's] skirt are the heads of two flayed elephants. Adapted from an Indian custom of clothing gods in animal skins, the elephants imply that the deity is endowed with power superior to that of the animal." 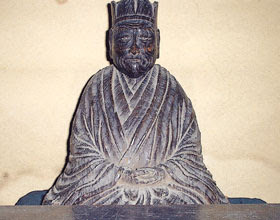 Saint Manku Shonin 満功上人 was the founder of Jindai-Ji. His father Fukuman 福満 fell in love with the daughter of Sato Osaukon 郷長右近(さとおさうこん), but her parents were not happy about this relationship and banished the daughter on an island in the sea. 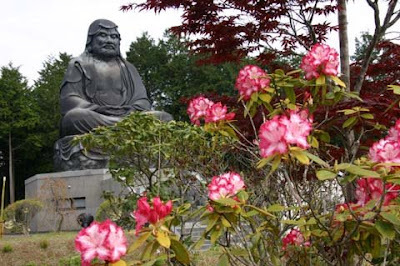 Fukuman was remembering the travels of Genjo Sanzo 玄奘三蔵 on his way to India and prayed to Jinja Daioo for help. And what do you know . . . there comes a sacred turtoise 霊亀 and he sat on its back all the way to the island. Now the parents were convinced the two belonged together and allowed the wedding. Born was Manku, who tried to atone for his father's sins by becoming a monk of the Hosso sect in Kyoto 法相. Jin 深ja Dai 大Oo = 深大寺 Jindai-Ji. The temple is blessed with clear water, flowing into the fields below, thanks to the "God of the Water". A red horse has been released into the fields and has run away. Am I going to lose my husband in the wilderness of Tama. There is already a poem about this horse in the Manyo-Shu poetry collection　from 759. It is about a loving wife who had to let her husband go to war in far-away Kyushu and wished to have him back safely. An amulet you buy for someone you love, to wish him/her well. 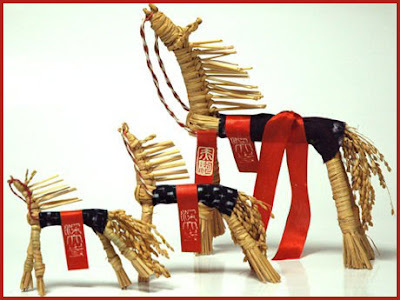 Some stores near the temple started to make this simple straw horse by hand, one by one even now since 1997, but before that it had been out of making for a while.
. Horse Amulets of Japan . One of the specialities of this temple is the painting of Sanskrit letters in the eyes of Daruma. The use of Sanskrit syllables is especially common in esoteric Buddhism. After all Buddhism came from India and Sanskrit is the old written language of this area. The Greek alphabet starts with ALPHA and ends with OMEGA whereas the Sanskrit uses A and UN or OM, as we have seen. In esoteric Buddhism every Buddha or deity is represented by one or more syllables of this Sanskrit alphabet. These important syllables are also called "Seed Syllables"(shuji 種字). There are special Mandalas where the deities are represented only by these letters, each one on a little lotus flower. 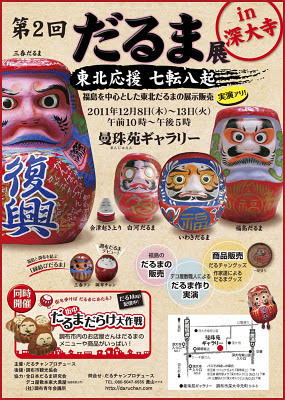 Let us have a closer look at the eyes of Daruma and the two chracters written in them. On the following HP you can find the seed syllables for every deity. This is a very useful dictionary, even if you do not read Japanese. Click on any of the names to find the according syllables. 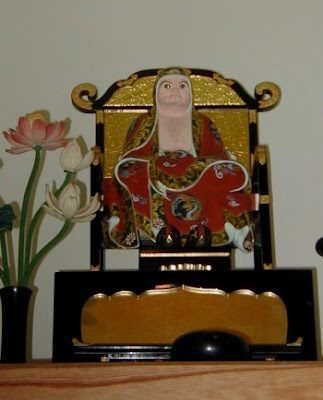 For example here is bonji for the Wisdom King Fudo Myo-O, one of my favorite deities. A-UN representing the beginning and end of all things-maybe the best rendering of this idea is found in the two huge figures of Nioo-Guardians at the entrance of the temple Todai-ji in Nara. This is a special method of meditation found in esoteric Buddhism. You sit in front of a scroll with a Sanscrit letter in a circle, usually the letter A, and meditate on its meaning. Since each deity has its own letter, you can use others too. Here are the three syllables for the Buddhas Dainichi, Fudoo and Aizen. - what can we learn from this? and sold them, the profit going to support Fukushima.
. Earthquake Darumam, Kizuna Daruma .
. Jindaiji Daruma Karinto 深大寺だるまかりんと . At night with only candles. His grave is in the precincts of this temple.
. Amulet with 元三大師 Ganzan Daishi . 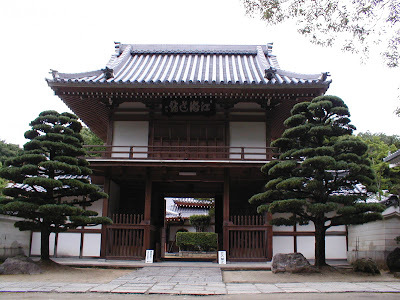 A Nichiren sect temple founded in December 8 1628. 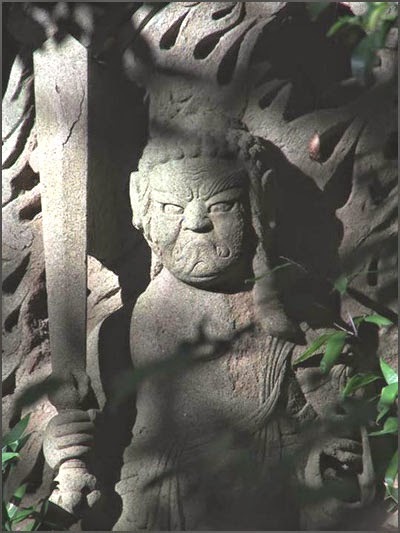 The statue in the Myoken-do Hall was carved around the middle of the Edo period and the deity it depicts is affectionately known as 'the Myoken of Narutaki.' Chinese quince trees line the approach to the temple while the cherry trees next to the Main Hall are said to have been transplanted from the Imperial Palace. Both quince and cherry trees are well known features of the temple. 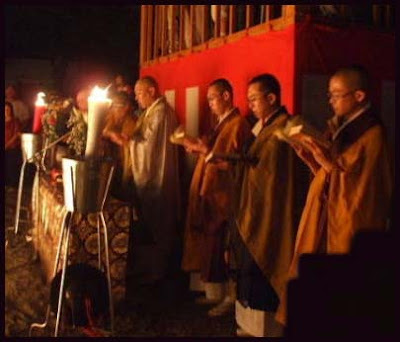 This festival is in memorial of Saint Nichiren and Nichiro 日朗上人. 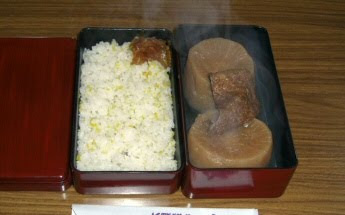 If you eat a piece of the radish stew, you will be protected for the coming year and also not contract palsy 中風封じ祈祷. Radishes are cooked with tofu from Saga 嵯峨豆腐. The big radish is like a nail of the big Buddha Hall. It tasts like the sweet dew in the paradise of Tooriten. There is also cooked rice with yuzu citron flavor, yuzu gohan ゆず御飯, another speciality which Nichiren liked very much and praized highly as food to warm the body. On the south of Shakujii Pond 石神井公園, just behind a little fox shrine, is the much smaller Ikefuchi Historical Park (池淵史跡公園) where shards of pottery were found, believed to be connected to the Shakujii Castle mentioned above. It is due to have a small museum built in it by March 2010. Just a little east of Ikefuchi Historical Park is Sanpoji Temple, built in 1394 and later moved here. At the eastern end of Sanpoji Pond, just in front of the site of Shakujii Castle, is where Japan's first 100 meter pool was built, in 1918, for training Japanese swimmers in preparation for the 1920 Olympic Games in Antwerp, Belgium. In 1989, the eastern end of the old pool was turned into a "Waterside Observation Park" (水辺観察園) where various rare waterside flora can be seen, and serving as a resource for the full renaturing of the area. Combined with a prayer for the no more war ! In this temple, there was a great statue of Daruma before WW II, but it was later given to a temple in Kobe and then Tokyo. Kobe was destroyed by the war in 昭和２０年３月１７日と６月５日. More than 56.000 people of Kobe perished. The head priest of Junshin-Ji later lent his Daruma statue to a temple in Kobe, which had not been completely destroyed. The head priest died very suddenly after that and the Daruma statue never returned. But after 60 years "in exile", this statue finally returned. 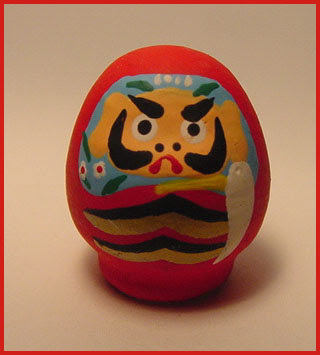 The present priest named it again, this time "fire-preventing Daruma", in the hope for no mor war in the world. This is from Sendai, Miyagi prefecture, about 1,5 cm high. Peace Daruma.. Praying for Peace ! His father was the poet Kuroyanagi Shooha 黒柳召波 (1727 - 1771). Kurekoma published a haiku collection of his father for his 7th death anniversary, 春泥句集 Shundei Kushu. They are sold at many temples and shrines to protect the homes from fire.
. Hi no yoojin 火の用心 fire prevention . This temple in Kasama town is famous for its Azalea and Rhododendron festival. The Daruma statue of this temple has been constructed in 2001. With almost 10 meters it is the highest in Japan ! More than 17.000 bushes are here in the park. former Owari Province, now a part of Midori-ku, Nagoya city. 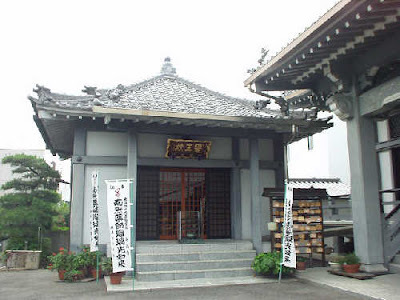 This temple is situated at the old Tokaido station Narumi 鳴海宿 . It was founded in 1582. 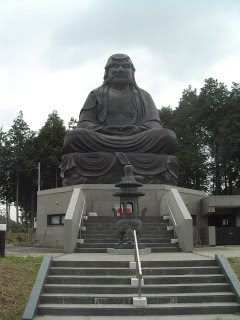 It is also famous for its statue of Yakushi Nyorai, Buddha of Healing, where even Oda Nobunaga came to pray. 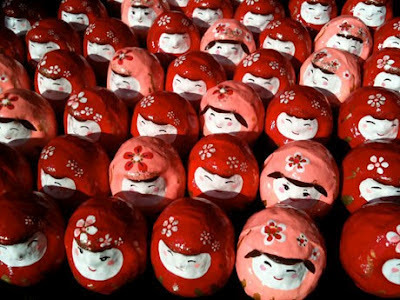 Daruma Dolls are burned in a ritual after they have helped people to realize a wish. 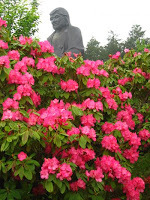 In Seiganji Temple in the town stands the oldest stone monument in memory of the master poet, Matsuo Basho. 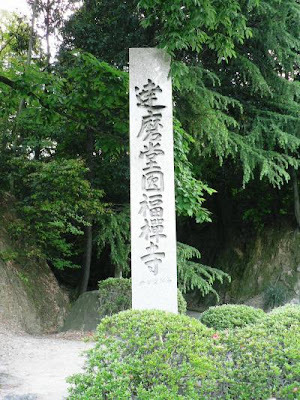 The old battle field of Okehazama, where Oda Nobunaga established his reputation in the Warring States period (1493-1573), is located just past this town. Having traveled about 350 km from Edo, a traveler in tie-dyed haori coat might have set out for the 13 km walk to the next Miya-juku post station, thinking of the remains of the warriors’ dreams as Basho did. This must have been a divine favor that only a traveler can enjoy. 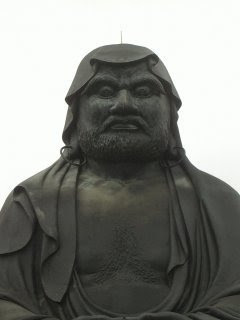 The statue was made by Takashima Kaemon. 高島 嘉右衛門. Kaemon, his name was also 寺島安信, was one of the six students of Basho in Narumi.
. WKD : Millet, barn millet (hie) . The first of the eight great Daruma Temples! A temple of the Rinzai Sect. Built in the Tenmei period 天明年間（1781～88）as a training place for the Temple Myoshin-Ji 妙心寺. 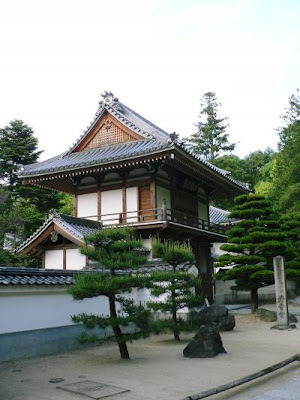 It has been re-constructed during the Edo period and is even now a place where many Zen monks train for their later life. 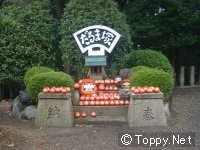 It hostes a famous statue of Daruma Daishi from the Kamakura period, one of the Three Great Daruma Statues. 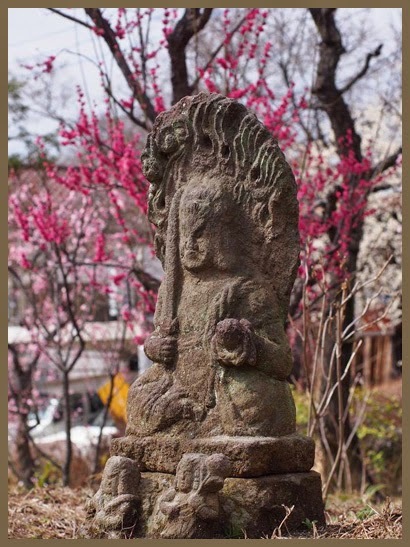 The statue is said to have been carved on behalf of Shotoku Taishi, or even by him. This statue used to be in posession of the family Tanaka at the shrine Iwashimizu Hachimangu and brought here in 1807. This secret statue is shown every year on April 19 and 20. Members of a special temple group Mannin Ko 万人講 (Manninko) get a special meal in red pots (akazen 赤膳). The statue of Daruma is also shown to the Group members on October 20. 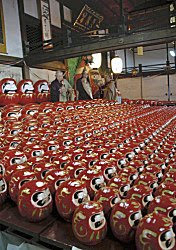 The temple holds a famous Daruma Market on this day too. He was deeply awakened, and with this his body was cured. He went to a sesshin at Empukuji near Kyoto and was able to completely realize his True Nature. This temple is located in Shiga Prefecture, Hikone City. It is the Family Temple of the Ii Family, the former Lord of Hikone. Ryotanji is at the base of Sawayama Mountain. The temple grounds themselves are surrounded by what seems to be a wall of trees. It feels almost like entering a different world. If you follow the path that goes around the back of the building, you come to a cemetery that goes up the side of the mountain. With the peace created by the setting of the cemetery and the trees, you sense how old this place is. The main temple building itself is another wonderful place. When you enter the building, you immediately go right. There are display cases holding many ancient treasures. If you look out the doors to the right, you see a great rock garden . This garden consists of small white stones which are raked to form a very elaborate pattern. In the middle is a large rock. The smaller rocks are raked in a pattern around this rock. I cannot imagine how difficult it must be to maintain this pattern. As you continue to walk around the temple building, you see many ornately painted, very old screens. This building is built in such a way that if all the screens are removed it becomes one large room. With the screens in place, it appears to be a series of smaller rooms. Many of the screens are now a little faded and worn. But, if you use your imagination, you can imagine how ornate they once must have been. Preparing 3000 Daruma dolls for the annual Daruma Market on April 1 and 2, at the temple grounds.